The wine industry has experienced major growth since 2006 and industry executives expect this growth to continue indefinitely. This demand for wine is in creasing among younger college students incorporating wine into their lifestyles as well as Baby Boomers who spend an increasing amount of money satisfying their palates. According to the American Wine Society, the nation’s top wine producing states are California, New York, Washington and Oregon respectively. California’s production is greater than 90% of this volume. As an economic generator, the wine industry contributes more than $45 billion to the U.S. economy, along with 556,000 jobs accounting for more than $12.8 billion in wages and $3.3 billion in state and local tax revenues. This industry is expected to grow exponentially in the years to come. The wine industry has shown major growth since 2006 and industry executives expect this growth to continue. The demand for wine is increasing with younger college students whose palates are becoming more sophisticated and whose budgets allow for it. Popularity appears to continue to grow as evidenced by the increase in new wineries as well as the promotion of its health benefits. Demographics of wine consumers are categorized home consumption and restaurant – bar purchases. Women are also among the consumers who count for a majority of wine purchases and who also enjoy wine in small, intimate gatherings. A quick glance at U.S. supermarket wine sales provides a clear picture of the growth trend in upscale wines. Wines priced at $8 and above are showing double-digit increases by volume, according to ACNielsen, which tracks laser-scanning data from 3000 supermarkets across the country. 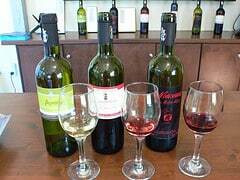 Red wine continues to edge out white wine as the top seller by volume in food stores holding 41.7% market share. White wine accounts for an estimated 41% share, while blush represents 17.4% share of the volume. Still benefiting from the “Sideways” effect, Pinot Noir shipments have experienced a dramatic 70% jump in food stores compared to previous years though from a small base of 2% share by volume. Chardonnay remains the top-selling varietal wine, followed by Merlot, White Zinfandel and Cabernet Sauvignon. Together, these top four varietals totaled 53% of all table wine volume in food stores. Source: Based on U.S. supermarket data from ACNielsen. Percentages may not add up exactly due to rounding. The positive health benefits associated with modest consumption of wine, particularly red wine, have been news mainstays that continue to bolster overall wine consumption. Simultaneously, younger consumers are becoming more interested in wine. The tremendous United States market, considered the world’s most profitable, is fueling competition from imports. Producers from around the world see the U.S. as a target market. Thought competition is fierce from Australia, Italy and Chile, even France is making a comeback and sales of imports are at an all-time high. In a review of the wine industry, Wine Business Monthly magazine compiled its fourth annual ranking of the Top 30 U.S. Wine Companies by U.S. case sales. These companies represent more than 90% of the U.S. wine market. While the number of large wineries has declined in recent years because of consolidation – 2004 and 2005 saw many changes, the number of new wineries opening for business continues to increase. According to WBM’s proprietary database, nearly 300 new U.S. wineries opened for business in 2006. There are now 5,970 wineries in the United States (see “Number of U.S. Wineries Tops 5,900” page 64). While people are moving away from the cheapest wines, they are also moving away from more expensive vintage wines as well. Showing an overall market trend of moving towards the middle. Sales are up by the glass but down by the bottle. So restaurants that generally buy and then resell the more expensive wines are opting for lower-priced varieties leaving vintage wines sales decreasing sharply. However, restaurant and bar sales are generally increasing their overall wine sales by having more affordable “by the glass” options. Expect vintage and boutique wineries to follow this trend and start producing a lower-priced version of their wines to stay competitive. Also tourists are less likely to visit wineries due to the nation’s current economic state. This is greatly affecting small wineries who often rely more on wine clubs, tours and tasting rooms for larger portions of their profits. 1 Best Customers: Demographics of Consumer Demand, New Strategist Publications, 2006. 4 Flinn, Ryan, Bloomberg.com, 2008, date accessed 23 December 2008.